I will never meet another person like my Dad. I'm willing to guess most people won't either. He’s one of the most interesting people I’ve ever come across. Everyone who comes in contact with him says the exact same thing. There's something about him that makes him completely different from everyone else, yet it's seemingly impossible to put a finger on what makes him tick. He has a way of thinking that’s so hard to follow, even he can't keep up with it. Sometimes getting him to take on simple, mundane tasks can turn out to be a herculean task. His approach to everyday topics can end up making you second guess everything you know, even with subjects you consider yourself to be an expert on! Being fully aware of this, I decided to take on one of the greatest challenges of my entire life. I made it my mission to teach my Dad how to play Tetris. With 100% accuracy, my Dad could look at a game of Tetris and tell you what it is. He doesn't play video games at all, but he knows what Tetris looks like. This ability comes from living in a house where three quarters of the family played Tetris all the time, especially my Mom. Because it was pretty much unavoidable, he gained knowledge of what Tetris looked like second-hand. However, despite all those years spent living around Tetris, he never sat down to play a round himself. In recent years, my Dad has been much more open to trying video games. He wants to find a game he likes. I don't know what inspired this, but I'm certainly down for the idea! For a couple years now, I've been pouring through all sorts of games to find one he not only likes, but can play as well. To be perfectly honest, finding a game he can play seems impossible. He can't tackle the physical controls. The idea of using both his hands to control two different things is a hurdle he can't leap. Still, we've recently reached the point where I had to get him some time with Tetris. 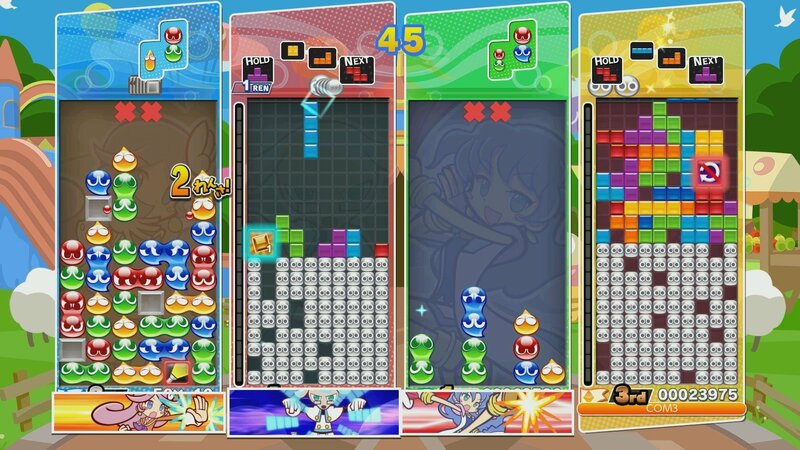 The Tetris game of choice for my Dad's first experience with the franchise has been Puyo Puyo Tetris on the Nintendo Switch. We've been keeping things as simple as they can get, going with basic Marathon mode. It's about as pure of a Tetris experience you can get in today's day and age. I thought it would be the perfect way to introduce my Dad to actually playing Tetris. Start things off with a nice slow speed, and see how it all played out. I let him watch the tutorial and lessons the game provides before he sat down to play. I told him to go at his own pace and take everything in until he actually understood what was going on. I was trying not to give too much input during the lessons. I let him study things and move ahead as he saw fit. When the most basic lessons played out, it seemed at a very rudimentary level, he understood what to do. That is, until an actual game started. This is where my Dad's unique nature came into play. I sat back in pure horror as I watched a man approach Tetris in a way which was completely alien to me. Through all the lessons, through every tutorial mode, my Dad had somehow come away with absolutely zero knowledge of what to do. Clearing lines was a concept entirely foreign to him. I don’t understand how it came to be, but my Dad somehow decided the way to play Tetris was to stack Tetriminos as high as he could. When he got a Game Over almost instantly, the look of genuine shock on his face was a sight to behold. For the life of him, he couldn't figure out why he had failed. This loss was followed by hours upon hours of teachings from myself. When I say hours, I am not kidding. We put in at least two hours in a single night where I tried to explain Tetris to him. No matter how slowly I went, no matter how many visual aids I used, he couldn't grasp it. I'm not going to say we didn't make progress, because we did. The thing is, measuring the amount of progress is something invisible to the naked eye. Anyone who watched my Dad play right now would think he was playing his first game ever. My Mom even came into the mix to try and smooth things over. She put in a few hours herself and the results were nearly the same. He’s no closer to getting past the very first level in Marathon mode. I know this entire story seems made up. I understand it's a very tough pill to swallow. This is usually how all stories involving my Dad go. People simply don't believe them until they meet the man himself. You'll just have to trust me on this matter. There is one silver lining to all this Tetris trial and error, though. My Dad, somewhere deep inside, does understand how to play Tetris on a basic level. He knows what needs to be done, but he can't put it all together. Whether the issue is with his dexterity or his puzzle solving skills remains to be seen. I don't know if he'll ever be able to tackle a game of Tetris past the first level. The thing is, I know he wants to. My Dad has been asking to practice when he comes over for a visit. He's also been doing the same thing at home with my Mom. He's seen what Tetris can offer and knows there's a lot of fun to be had. Truth be told, he's actually having fun trying to figure it all out! He wants to push through the struggles and get some success. 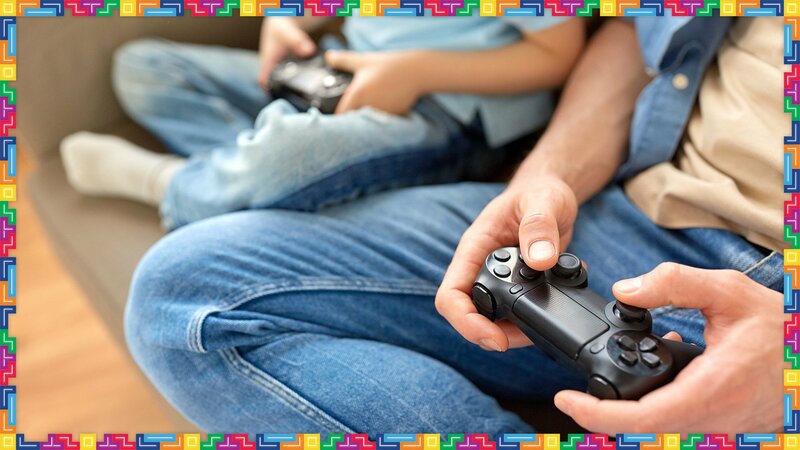 His goal is to get into the gameplay and fun he sees the rest of the family having. This is something I've never seen him show through all the games he's watched me play or tried himself. That right there speaks volumes for the allure of Tetris. Will he ever meet success? I honestly don't know. "Outlook not so good," as the Magic 8-Ball says. Rest assured, if he ever has any modicum of success, I'll be sure to report back to you guys! Perhaps today is your first day trying Tetris as well! If so, why not give it a go for free on Tetris.com?